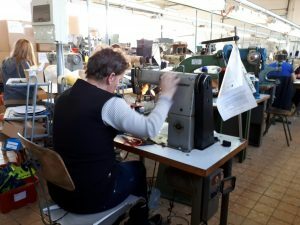 Within the project “Partnership for quality jobs and competitiveness”, as a part of planned activities for organizing training for work in industry, training for unemployed persons for work in footwear production (sewing profession) and for work in the wood processing sector (designer for technical preparation profession) have begun. 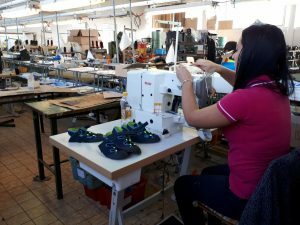 Training is carried out at the footwear production company KLM d.o.o. and wood processing company Rizba d.o.o. from Prnjavor and includes 20 days of intensive practical training for industrial occupations, during which unemployed persons will acquire necessary knowledge and skills for mentioned professions. The trainings are performed by trainers with rich experience in trainings and industry. 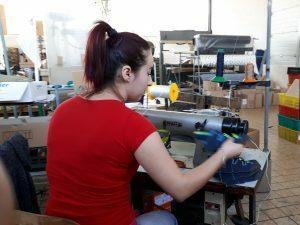 The training is attended by five unemployed women from Prnjavor, out of which three are younger than 30 years, while two trainees are part of hard-to-employ category of unemployed persons, since they have been registered at the Employment office for more than five years (one trainee is reported as unemployed since 1999, and the second one since 2009). Out of the five applicants, two of them have previously attended training for active job searching (two persons who are belonging to a hard-to-employ category of unemployed persons), which is also organized within the project activities. This fact in the best way shows the usefulness of these types of the trainings and necessity of activation of unemployed persons for job searching activities. The trainings were organized in accordance with the real needs of the companies for recruitment of new workforce, while trainees were selected in cooperation with company representatives. In this regard, if the trainees show good results during the training, there is a great chance that they will be employed by the enterprise where the training is organized.